Traditionally, approaches to managing resources in society or providing services have tended to be presented as a stark choice between control by the state or by market mechanisms. This binary division ignores a crucial third possibility: management by autonomous citizens. Evidence suggests this approach is crucial to the wellbeing of both individuals and societies. One: a medieval city called Ghent. The remnants of the age-old St-Baafs abbey are a public museum. Sounds logical; it is where the history of the city started. But the municipal government had to cut its budget and, as there are not many visitors, the site is closed. For a few years, nothing happens. Who cares? Then the people of the neighbourhood decide it is a great shame, a beautiful medieval refectory and garden hidden from public life. They take action because such a thing of beauty should be shared by everyone. They start a citizens’ initiative and organise lectures and concerts in the abbey. It evolves into a very successful organisation. Twenty years later, around 150 volunteers organise more than 200 public events, reaching out to thousands of people. A vibrant new urban common is created. Two: a big country called Germany. In the 1990s, the state produces electricity mostly from nuclear energy and fossil fuels. Even in light of climate change, the four big German electricity companies think that business as usual is the only way forward. Investing in renewables is laughed at. So citizens come together and start their own energy initiatives, mostly renewable energy cooperatives (REScoops). In cities and villages, the idea turns out to be contagious, and together they start to change the energy system. Nowadays, half of the new renewable energy systems in Germany are owned by citizens and their organisations. Call it a state-wide network of local commons. These examples are true, but they only tell half the story. In Ghent, the neighbours had to ask for the key to the abbey. The civil servant responsible, probably a visionary, not only gave it to them but added: “Nobody can inspire such an abbey as a neighbourhood”. Several departments of the municipal government actively supported the citizens’ initiative by, for example, announcing the activities in the newsletter of the official neighbourhood centre. The responsible alderman had to back their civil servants who, in a gesture of trust, just handed over the keys; after a while, on a permanent basis. In Germany, the REScoops could only establish themselves in such numbers because of a stimulating legal framework, with stable feed-in tariffs for the renewable energy delivered to the energy network. First introduced in 1990, this law was consolidated with the ambitious Law on Renewable Energy, (and other far-reaching government policies), ten years later. When the financial crisis arrived later, putting your money in renewable energy systems was not only a civil gesture, but also a financially smart move. These two examples are in line with research done in the Netherlands on citizens’ initiatives. In one way or another, they all have to rely on support from the government, be it for a space they need for their activities, a piece of land for urban agriculture, or some money. As we will argue, this support is not a problem, but rather a vital part of democracy. There is still a dimension missing in these stories: the economic one. People in Germany who produce their own renewable electricity still sell it on a market, albeit a highly regulated one. And, luckily, when there is no wind or sun they can buy energy that comes from other sources or other countries. Even if the ‘Neighbours of the Abbey’ is run by volunteers, they also have to pay their bills. So they run a café during their activities, which, from a Belgian perspective, is the most obvious thing to do financially. Together with the Liberals and the Socialists, ecologists acknowledge that a combination of market, state and autonomy components is optimal. Let’s move from the examples to the general societal debate. If, for instance, we look at opinions about how we should organise housing, they tend to lie on a spectrum between two opposing views. On the Left, there is the view that the government is the best option to organise it in a fair way. On the other side, the Right argues that only the market can allocate houses in an optimal manner. On a higher level, a lot of commentators interpreted the fall of the Berlin Wall in 1989 as the victory of the Right side of the spectrum. Concretely, in countries such as the UK, this led to the dismantling of public social housing, and the transferral of care homes from the public to the private sector. What matters is that discussions on this, as well as other areas of society, are trapped in a Left-Right framework, within which the radical Left, without any critical analysis, invariably pushes the government forward as a solution and the Right, equally unquestioningly, only sees merit in the market approach by private companies. It is as if the citizen – the bearer of democracy – may only watch from the side-lines and is unable to propose solutions to societal needs. Remaining on the question of housing for elderly people, arguments for citizens’ initiatives, the Abbeyfield Houses for example, are rarely heard in the mainstream debate. This initiative was born in 1956 in Britain in response to a growing social problem: an increasing number of elderly people in the poor neighbourhoods of London were no longer able to live independently in a dignified manner. Today, the British Abbeyfield Society manages 700 homes with 7,000 seniors, aided by 10,000 volunteers1. Abbeyfield is a concept of collective living and a volunteer movement which has already taken root in many countries. This is not to imply that citizens’ initiatives are the panacea for all challenges; but they can be an important part of the future if we are willing to widen our gaze. These examples clearly demonstrate that we have three basic options to address these challenges and to organise society. This broadened view of society can be visualised in the following triangle. The spectrum discussed above is actually only the line at the base of the triangle. Each corner indicates an extreme society: a fully market-oriented society; a 100 per cent state-run society; or one exclusively managed by autonomous citizens. How a given society formulates a response to a social need – such as the nursing homes – can be situated within this triangle. With this broadened view we come to the core of political ecology, as has been pointed out by the philosopher Philippe Van Parijs. For this presentation shows the narrowness of the dominant discourse in our society (oscillating between more state or more market), as it only takes place on the horizontal side of the triangle. 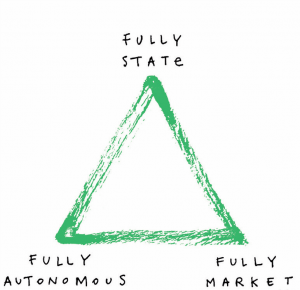 Once one conceptualises the three corner points, with autonomy above as the vertical dimension, it becomes immediately clear that when the liberal and socialist logics praise the importance of the market or of the state, they not only advocate less state or less market, respectively, but plead also for a smaller autonomous sphere. But there exists a third perspective that emphasises autonomous activities and, thus, less of both state and market involvement. The horizontal ‘Left-Right’ axis is typical of modern industrial society; transitioning from this line up to the top of the triangle is a feature of the current post-industrial society that promotes other forms of participation in social life from the perspective of autonomy, rather than that of money and work. This is exactly the field of the commons. The autonomy perspective is a key element of political ecology (ecologism). As for the other two ways of thinking, it is not desirable, from a Green perspective, to drive society into any single corner of the triangle. Together with the Liberals and the Socialists, ecologists acknowledge that a combination of market, state and autonomy components is optimal. At the same time, their point of view distinguishes itself clearly from the liberal and socialist approach. For ecologists, autonomy represents the joyful potential to shape the world together. Autonomy is at odds with a unilateral individualisation: the joyful shaping is always done in cooperation with others. Therefore, ecologists speak about connected autonomy: I can only find fulfilment and build a world to live in through a fruitful connection with others, which also entails the dimension of care, for each other, for the world we live in, and for our living planet. This perspective is related to the notion of stewardship: our freedom to act and change the world implies, at the same time, feeling responsible for it. With more and more citizens taking initiatives of their own, the challenge for governments is to turn themselves into a partner state, as is already happening in Bologna and Ghent. As a source of social innovation, the importance of the autonomous sphere cannot be underestimated; a lot of solutions to societal challenges did not come from the government or from business, but from creative citizens. The aforementioned Abbeyfield Housing is a good example, as are social innovations such as car sharing, organic farming initiatives, and food teams2. And who built the first windmills to produce electricity? It was citizens developing a positive alternative to nuclear plants in countries like Denmark and Ireland. The triangle shows that political ecology cannot be reduced to environmental protection. Ecologists want not only to respect the boundaries of the earth’s ecosystem; they strive at the same time for a larger independent social sphere where people can deploy their capabilities without the interference of market or state. The final goal is a good life for all. As these examples show, most citizens’ initiatives rely in one way or another on cooperation with the state. This is not a problem: it is the future. The neoliberal regime of the last thirty years dictated that the best approach to organising anything in society was one based on markets and competition. This has led to a wide array of public-private partnerships, which, most of the time, leads to a government losing its grip on policy areas and citizens paying too much tax for the services delivered. Again, the triangle clearly shows the alternative, future way to develop: public-civil partnership. With more and more citizens taking initiatives of their own, the challenge for governments is to turn themselves into a partner state, as is already happening in Bologna and Ghent. Here, politicians don’t see their political constituency as a region to manage from above, but as a community of citizens with a lot of experience and creativity. Leaving top-down politics behind, they develop forms of co-creation and co-production. In Ghent, citizens developed, within the frame of a participatory climate policy, the concept of ‘living streets’: they decided by themselves to reclaim their streets, getting rid of all cars for one or two months. And the municipal government took care of all the necessary measures to make it happen in a legal and safe way. With public-civil partnerships, an underestimated area of the triangle of societal possibilities is explored in a positive way. 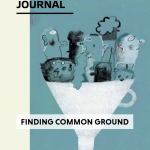 Stimulating and sustaining the commons requires an active state which develops new institutions that allows citizens to engage in transition projects. With the revival of the commons, it has become clear that there exists a third fundamental way to develop and organise society. Centred on the basic principle of autonomy, it has its own logic, consisting of specific forms of social relations based on reciprocity and cooperation. It is more than probable that new commons initiatives will form a crucial part of the transformation towards a social-ecological society. At the same time, it would be very unwise to strive for a pure ‘commonism’. Just as with communism or neoliberalism, a society based on only one of the three approaches to organisation is unable to cope with the broad array of severe challenges we face nowadays. Having said that, stimulating and sustaining the commons requires an active state which develops new institutions that allows citizens to engage in transition projects in a secure way, so their autonomy and creativity can flourish. In combination with other innovations, a universal basic income could be part of this new socio-ecological security framework for the 21th century. The indispensable value of the commons movement is that it enhances and adds to the institutional diversity of societies; one of the key features of resilience. This is probably the most important argument at the political level in favour of the commons. At the level of who we are and how we relate, it stimulates the basic human ability to cooperate and take care of ourselves and each other. What more can we dream of, than citizens using their freedom to take their future in their own hands?